Something new in the hookup of a cartoon character with advertising has been worked out by Jim Alley, cartoonist for the Memphis Commerical Appeal and his manager, Hugh J. Mooney, son of the late C.P.J. Mooney. The plan, already under way in Memphis and several other cities where the comic character "Hambone" is used editorially, has a contest angle and presents advertising selling talk through the subtle and philosophical utterances of the darkey. Advertisements, of which there may be a dozen or 50, and six cartoons are packed in a page, to be run weekly for 30 weeks by the newspaper using the series. It is proposed to offer the advertising plan first to those newspapers using the "Hambone" cartoon editorially, Mooney says. A series, the first, began in the Commercial Appeal March 7, 39 advertisments being on the page in addition to the six cartoons. Under the plan, each advertiser is represented in a cartoon one or more times during the series, depending on his position and space on the page. A hand-coloring contest in which weekly prizes and a grand prize are given is a part of the general advertising stunt. Readers are asked to color the cartoons with crayon or other materials, mailing them with self-addressed envelope to the newspaper office. One of the rules of the contest is that cartoons must not be cut out of the page. Entrants are required to give their name, age and address. "It is through this hand-coloring feature and the plan under which it is managed that great value comes to the advertiser," Mooney explains. "There are color crayons or water colors in every home. It is inevitable that someone in the family will attempt to color Hambone's clothes, shoes and lips and the background in the cartoons. "Soon the whole family is crowded around, offering suggestions, trying to help, and all the time unconsciously absorbing the names of the advertisers and what they have to sell. "Each week the pages are returned to the entrants after being judged for the weekly prizes. They keep them and submit them again at the close of the contest for the grand prize. "And since one of the rules of the contest is that cartoons must not be cut out of the page, entrants from week to week are referring back to former pages and so reading and re-reading the advertisements. They are comparing this week's work with that of last week and with that of the week before. The advertiser is continually getting his message read, weekly increasing its pull." Prizes, in addition to the weekly and grand prize, may be offered every week by advertisers who want entrants and others to visit their places of business, according to the Alley-Mooney plan. "In a little strip at the bottom of the cartoon layout contestants are told to take their pages to certain advertisers on certain days for judging," Mooney says. "In this way the advertiser makes new contacts and friends and can get some idea of results of his advertising." According to the contest rules, each entrant must give his age. "The age is important information for the advertiser. As I expected, the vast majority of those entering the contest at Memphis and other cities are adults." The advertiser is urged to change his copy every week under the plan. "I suggest each advertiser use his space, position of which is unchanged throughout the 30 weeks, for specials. General advertisements are discouraged as much as possible. "One feature of our page is that no two different advertisers, theough they be in the same line of business, may advertise the same product. For instance, we have two auto concerns on the page. One may advertise a special make of car and the other trucks. An effort is made to keep lines non-competitive wherein it is possible." The six cartoons may be placed at the top of the page or equidistant from one another and the border, as advertisers desire, Mooney explains. And the number of cartoons our advertiser may receive in the series depends on space and position he buys. "Shucks! W'en you buys one dem good cyars you jes' natcherly gits hoss power and mule endurance." Trade names are not mentioned in the balloons. Cartoons are changed each week, advertisers remain the same, but advertisements may change, though space and position do not. The idea, plans and cartoons are copyrighted by Alley. "We will lease the method and Hambone commercial cartoons to papers at so much an inch over the regular rate, with a minimum guarantee, both as to amount and number of weeks to run," Mooney says. "The papers are to sell the same to advertisers, using their regular advertising staffs." "Neither Mr. Alley nor myself feel he is prostituting his talents in any way. "He is open to suggestions from advertisers at all times, but reserves the right to express himself in a way he desires and believes best expressive." Jim Alley, 44 years old, has been on the staff of the Commercial Appeal 13 years, joining that paper in 1915 when the late C.P.J. Mooney was editor. It was Editor Mooney who discovered Alley's talent when the artist was plugging away at a desk in the Bluff City Engraving Company. For many years it was Editor Mooney who furnished a great many of the ideas for Alley's cartoons, especially those of a political nature. Alley gained prominence in the South the time Ed Crump, boss of Shelby County's political organization, was ousted as mayor in 1915. Mooney, the son of the late editor, has made an extensive study of advertising and promotion. For the last five years he has maintained a laboratory in Memphis in the Western Newspaper Union building and at the present is working on television and its adaptability to advertising. He believes he is the first person to receive television more than 1000 miles.
" --He believes he is the first person to recieve television more than 1000 miles." In early 1929? In Memphis? -------------Another "Hambone" advertising item is commonly-found at flea markets. It's a small cardboard sign for "J.P.Alley's Hambone Cigar", showing the politically incorrect character flying an airplane. ----Cole J. Is Jim Alley any relation to Cal Alley? Cal Alley (1915-1970) was the son of James Pinckney Alley, who died in 1934. For a visual list of the various fake Hambone cigar boxes and other fake Hambone items, go here.
"' --He believes he is the first person to recieve television more than 1000 miles.' In early 1929? In Memphis?" Not entirely out of the question. In this period you'd be talking about mechanical rather than electronic television. Mechanical television used a system of spinning discs to capture and receive images. Two things are worth noting: first,there were about 18 mechanical TV stations licensed and in operation in the United States in 1929 including a number in the Chicago area; second, most of these stations operated in the Medium Wave band (530 kHz to 1600 kHz) or the low Shortwave band (between 2 and 3 mHz). Propagation at these frequencies is usually quite good; I've heard AM stations from Saskatoon as far away as San Antonio Texas. So TV signals at those frequencies and a less crowded spectrum than today is quite possible. Han Horina was born in Bohemia on May 13, 1865. That information was recorded on his naturalization card from the U.S. Department of Labor, Immigration and Naturalization Service. The card said he arrived in the U.S. on March 6, 1906. 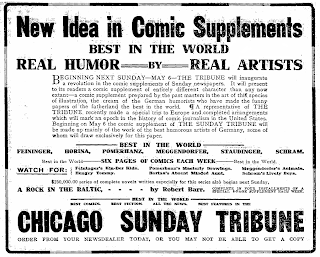 Horina and other well-known German artists were brought to the U.S. by the Chicago Tribune in early 1906. 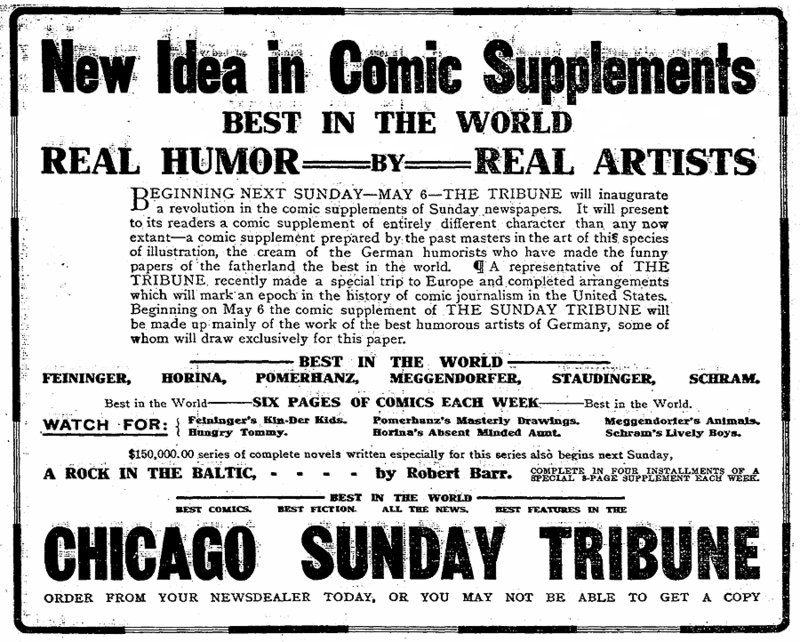 The Tribune advertised the new six-page comics section, featuring these artists, which was set to debut on May 6. Within months, Horina's earnings allowed him to bring his family, living in Horn, Austria, to the U.S. His wife, Marie, and children, Fritz, Elisabeth, Hans and Ernest, departed Hamburg, Germany on June 7 aboard the steamship Kaiserin Auguste Victoria. After stops in Cuxhaven (Germany), Dover (England) and Cherbourg (France), the family arrived in New York on June 18, as recorded on the passenger list. The Tribune eventually let go the group of German artists. According to one of Horina's great grandchildren, "Hans could not afford to go back to Austria, so he began doing artistic work for postcard companies." In the 1910 U.S. Federal Census the Horina family resided in Northfield, Illinois, a northern suburb of Chicago. His occupation was artist working at home. The census revealed that Horina had changed his first name, Hans, to John. Horina's naturalization card confirmed the name change. He was naturalized on January 30, 1913; at that time he lived in Shermerville, Illinois. According to one of Horina's great grandchildren, "Hans moved his family to Louisville, KY which had a big German community." Horina found work, as an editor, at the German language newspaper, Louisville Anzeiger. He is mentioned on page 532 in the book, The Encyclopedia of Louisville (University Press of Kentucky, 2001); below is an excerpt. editor, John F. Horina, was required to submit an English translation of editorials to an official of Jefferson County before their publication. He also published a book, War Cartoons: Pictures About the War for Sympathizers with Germany and Austria-Hungary (Allan's note: I cannot find any trace of this being published, but then again I've lost my access to WorldCat - woe is me). Horina's first two sons, Fred John and John Emery registered with the draft on June 5, 1917. Fred was a bookkeeper. John was a pressman at a printing house; like his father, John changed his name from Hans. Horina's third son, Ernest George, registered with the draft on August 24, 1918; he worked at a railroad company. forces. He was a member of the Concordia Singing Society, the St. Joseph's Orphans Society and numerous Catholic organizations. Tuesday morning the funeral was held from Holy Name church. Father John O'Connor celebrating the requiem high mass. After Horina's death, the family carried on. In the 1920 census the Horinas lived at 4729 Southern Parkway. Marie was the head of the household. Fred was married to Clara; eventually they moved out. In the 1930 census the family lived at 4706 Second Street, with Marie the head of the household. John and Ernest were single; Elizabeth was married to Rodolf [sic] and they had two children, a boy and girl. According to the Social Security Death Index, Ernest passed away in December 1965; John in October 1980; and Elizabeth in February 1985. Description: 50 p. illus. 4to. Reproduction: Microfilm. New York, N.Y.: New York Public Library, 19--. Subject: World War, 1914-1918 -- Humor, caricatures, etc. Ah, thanks for the link Alex. I didn't even know WorldCat now allows for personal accounts; used to access with a library password that finally went out of date. News of Yore 1908: Sssh! You'll Get Me in Trouble! Henry Edward Warner, general press representative of the Shubert enterprises, leaves that position August 1 to establish a novel newspaper enterprise. Donald Morris Jones, who has been Mr. Warner's assistant, will be associated with him in the venture, which will furnish specials and circulation boosters to the larger newspapers of New York and the country generally. Ryan Walker will be in charge of the cartoon department. The matter to be sent out will be known as the Wardon Specials and will include fiction, humor, dramatic criticism, photographs and occasional humorous articles by Mr. Warner, who formerly wrote over the nom-de-plume of "Sidelights" for the Denver Times and Baltimore News and who organized and was first president of the American Press Humorists. Mr. Warner was born in Ohio thirty-four years ago and was educated at the University of California and U.S. Grant University, Chattanooga, Tenn. When about twelve years old he published a paper of his own, called the University Sun. He became city editor of the Chattanooga Times, Knoxville Journal and Tribune, Baltimore News and Denver Times; acted as press agent for Sarah Bernhardt and was appointed general press representative of the Shubert enterprises. Mr. Jones, who is a graduate of the Temple College, Philadelphia, was born twenty-seven years ago and began his business life with the Ireland Advertising Agency. He made a tour of the best part of the world as a representative of Eugen Sandow, the strong man, and this season became assistant general press representative of the Shubert enterprises. Sir: Howard Miller, president of the International Syndicate, Baltimore, Md., requests me to write you regarding the announcement which appeared in the last issue of The Fourth Estate relative to my being engaged by the Wardon News Syndicate as their cartoonist. The announcement was a slight mistake, and I sanction Mr. Miller's request to have it corrected. I am at present cartooning for the International Syndicate, and anticipate doing no cartoons for any other organization. In justice to Mr. Warner, however, allow me to explain that I promised him some time ago to do theatrical caricatures for a theatrical feature, provided it did not conflict with any service put out by the syndicate I am now connected with. Doubtless Mr. Warner made the simple mistake in using the word "cartoons" instead of "caricature." A quick glance at these strips, especially if your eyeglass prescription needs updating, tells you that you're looking at George McManus art. A closer glance will have you thinking George must have been drawing these with his left foot. But no, this isn't the work of George McManus, but rather his brother Charles. Charles made a little cottage industry out of this bargain basement version of his brother's style. In some of Charles' strips it is pretty clear that brother George either gave him a hand or provided model sheets from which Charles could copy. Charles' longest-running creation was Dorothy Darnit, but he also penned this strip, Mr. Broad of Wall Street, for the same outfit, Bell Syndicate. Mr. Broad debuted on December 5 1921, changed names to Freddie the Financier on March 27 1922, and is last found running new material on April 7 1923. As with Dorothy Darnit, though, the strip was resold to country papers for many years afterward. I've seen Mr. Broad running as late as 1932. What I find interesting about Mr. Broad is that the art is a full step above the quality of the Dorothy Darnit strips, which are really pretty cringe-worthy. Did Charles get more help from his brother on this one, did he apply himself more to this one for some reason, or did he employ a ghost? I dunno. I do know that the brothers were pretty close. Charles eventually got a high-level position at King Features, presumably but not definitely on George's coat-tails, and my impression is that Charles was no bumbling fool but rather had a pretty good head for management and business. But very little has been written about him, so to try and decipher the relationship between the two, and how much of Charles' success was directly due to his famed brother, is up in the air. Thanks to Mark Johnson for the scans! Hello Allan--These came from my brother, Mark.----Cole, The Charles of the Johnson Clan. Charles W. McManus was born in St. Louis, Missouri in July 1880 as recorded in the Registry of Births, City of St. Louis; the partially obscured day of birth looks like 30. On his World War I Draft Registration Card, the partially obscured day of birth looks like 31; his middle name looks like "Waldaull". The California Death Index recorded his day of birth as 3. According to the 1900 U.S. Federal Census, Charles was the second of three sons born to George and Kate; Leo was born four years before Charles who was followed by George Jr. two years later. Charles was a salesman of dry goods. The family lived in St. Louis. In 1910 Charles and his parents lived at 549 West 113th Street in Manhattan, New York City. His occupation was printer in advertising. Charles signed his World War I draft card on September 9, 1918. He lived with his parents at 551 West 170th Street in Manhattan. His occupation was clerk at the Boyle Robertson Company. His description was short height, medium build with brown eyes and dark hair. In the 1920 census Charles lived with his mother at the same address just mentioned. His occupation was artist in the comic picture business. Charles passed away on August 31, 1941. His death was reported in the New York Times on September 1. [sic] Hospital. His age was 61. "Tiny" and "Mr. Wall in Broad street [sic]." for the last three months. Another brother, Leo McManus of New York, also survives. Thanks Cole, and I've updated the post to properly credit your brother, Charles (good one!). Alex, this is interesting stuff. Don't recall having read that Charles helped with gags on BUF before, though I suppose it's natural. I could swear I saw a memo from George to Charles from 1943 regarding the new third-page format for the strip, but that just shows how addled my gray matter is. Thanks for setting me straight. Augustus O'Shaughnessy, who until recently was an illustrator on the staff of the Chicago Daily News, has opened a studio in the Fine Art Building, Chicago. Wallace Goldsmith, a cartoonist on the Boston Herald, made his debut in vaudeville at Keith's Theatre, Boston, recently in a lightning sketch act. A.W. Scarborough, better known as "Scar," has resigned from the cartoonists' staff of the New York Globe and joined that of the World. John Farnum, cartoonist for the Springfield (Mass.) Union, was married July 18 at Albany, N.Y., to Miss Martha Ferguson. Mr. Farnum formerly was on the staff of the Boston Post, Boston Traveller, Providence Telegram, Albany Times and other papers. F.M. Howarth, one of the best known comic artists in the country died in Philadelphia Tuesday, aged forty-three years. He began work on Puck and later was employed on the Hearst papers, is credited with having originated the comic series using the same characters day after day in the newspapers. Two of his best known series were "E.Z. Mark" and "Lulu and Leander." George McManus, creator of the "Newlyweds" series of cartoons appearing in the New York World, has gone into vaudeville. He appeared successfully at the Alhambra, New York, last week, his specialty being making sketches of his cartoon characters on a blackboard. The Danbury, Conn., Agricultural Society has awarded a diploma to the New York World for its exhibition, at the recent fair held by the association, of original drawings and plates of the "Newlyweds" series of comic pictures appearing in that paper. Peter B. McCord, cartoonist and author, died Tuesday in his home, at 190 South 9th Street, Newark. He was forty years old. For eight years he had been on the Newark Evening News' staff. A book entitled "The Wolf," illustrated and written by himself and dealing with the life of the ancient cave dwellers, is about to be published. Charles Tebbs, manager of the art department of the New York World, has been succeeded by T.O. McGill, an artist of that department and originator of the "Jollys' Bull Pup" series of cartoons. Mr. Tebbs' future plans have not been announced. George McManus, the New York World artist and creator of the celebrated Newlyweds, Panhandle Pete and other comic pictures, was married to Miss Florence Bergere, the original Mrs. Newlywed, on Wednesday. 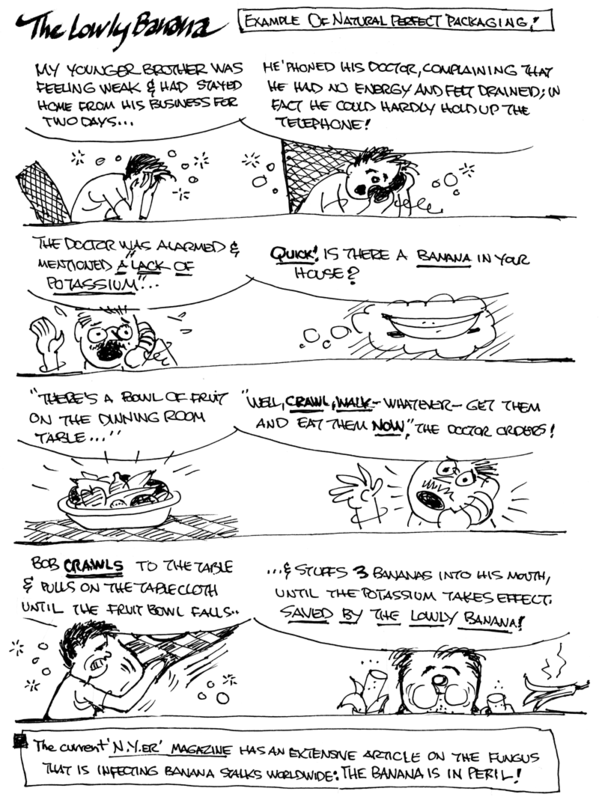 "Walter Saalberg, a cartoonist at different times connected with the New York Journal, Chicago Chronicle and San Francisco Examiner, died recently in Harrisburg, Pa., at the age of thirty-two years. [this cartoonist was in all the same cities as Charles Saalburg but mostly at the wrong papers -- really botched obit or extreme coincidence?]" Neither, Walter L. Saalberg (1877-1908) was the brother of Charles W. Saalburg (1865-1947). They were 2 of the sons of William Saalburg (1834-1914), publisher and editor of the Hebrew Observer in SF. (another brother was a journalist). Thanks for solving that mystery -- weird that the brothers spelled their names differently! Seems you might know a bit about Charles Saalburg, I've been looking for biographical info for many years. Any suggestions? Wish I knew more about Walter for you, you would think the history of American Printing would have lots about him. I do see that his dad also edited the (SF) Wasp at some point. Lastly, names were at loser a hundred years ago than they are now. many stated didn't have registered births until the 1910s, and my family actually settled on a preferred last name spelling in the circa 1890s. I've seen Walter's dad spelled both ways. Walter L. Saalburg was born in San Francisco, California in April 1877. According to the 1880 U.S. Federal Census Walter was the seventh child of William and Jennie; the family resided at 1308[?] Geary Street. Walter lived in Chicago, Illinois at 5646 South Boulevard, as recorded in the 1900 census. He was a boarder with the Frink family which was headed by George M., who was employed at the Monotype Foundry (The cartoonist George Frink's middle initial was O.) Walter's occupation was an artist. In 1901 Walter lived in Cleveland, Ohio where he married Lucile Goodhart on May 24; in the "US, Ohio, Cuyahoga County, Jewish Marriage Record Extracts" his last name was spelled "Saalberg". The couple divorced on July 1, 1905 as recorded in the Cuyahoga County Archives. Walter's passing was reported in the Patriot (Harrisburg, Pennsylvania) on August 25, 1908.
died yesterday morning at the Harrisburg Hospital. According to the JewishGen Online Worldwide Burial Registry, Walter was buried at the Hills of Eternity Memorial Park Congregation Sherith Israel in Colma, California on April 16, 1909. Walter and his brother Charles are included in the book, Artists in California, 1786-1940: L-Z (Crocker Art Museum, 2002).